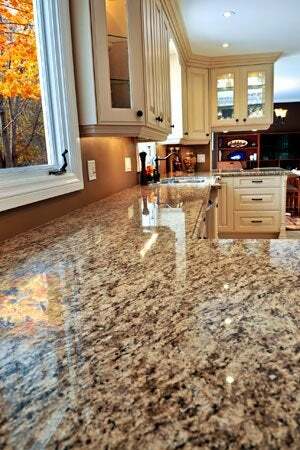 If you’ve got a gorgeous granite countertop and want to keep it in “show home” shape, you may need to seal it. Some countertops come pre-sealed, but if yours did not (or you’re not sure) don’t delay giving it the shield it needs. Improper cleaning, neglected spills, and other issues of everyday use could easily mar the surface otherwise. The proper penetrating (or impregnating) sealer will soak into the granite, filling the porous gaps, to keep damage at bay. 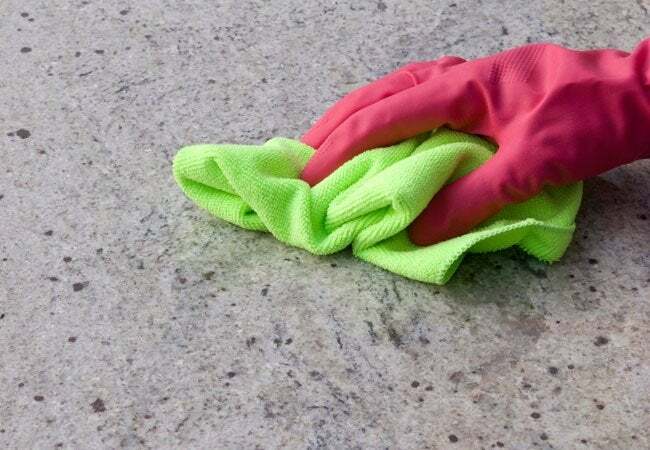 True, a sealant only buys you time—unattended spills will seep into sealed granite eventually—but the right one and the following steps for how to seal a granite countertop will certainly help protect your investment. Water-based sealants are environmentally friendly, while solvent-based sealants may go deeper into the stone—though this is arguably only important on polished granite. Check water- or solvent-based sealant labels for the active ingredient “fluorocarbon aliphatic resin.” Though the product will be pricier than those containing such agents as siloxane and silicon, fluorocarbon aliphatic resin will provide five to 10 years of protection, versus six months to three years with other sealants. What’s more, fluorocarbon aliphatic resins repel oil as well as water, so your granite won’t be ruined by a salad dressing mishap. A quart of fluorocarbon aliphatic resin sealant costs about $35 and offers between 150 to 250 square feet of coverage, depending on brand. A 24-oz spray bottle of lesser solvent runs around $15 but might require reapplying every six months or so. 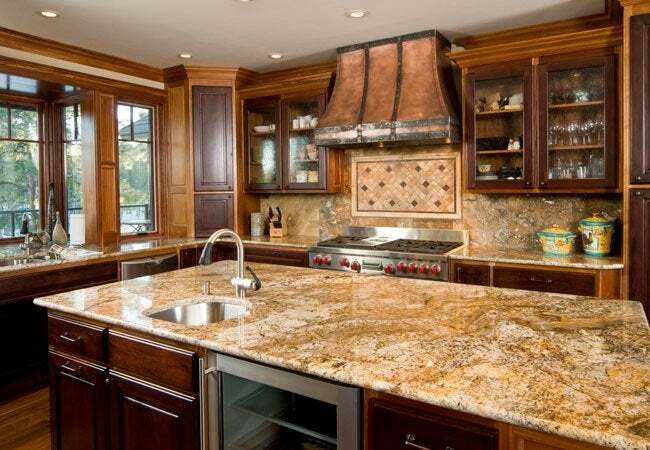 Ahead, you’ll find general guidance for how to seal a granite countertop with either variety, but specific directions vary according to brand and active ingredients. It’s crucial to follow label instructions on the sealant you buy in addition to these handy guidelines for the best results. Determine if the countertop requires sealing. Somewhere inconspicuous, like in a corner of the counter, put a few drops of water on top, and a few inches away, put a few drops of oil. After 15 minutes, check to see if the water or oil has seeped in and darkened the granite. If so, proceed with these instructions for how to seal a granite countertop. If not, then the countertop is already sealed, and doing so again will not offer extra protection but only leave an unattractive hazy film. Clean the countertop 24 hours before sealing, making sure to avoid potentially damaging vinegar, lemon juice, baking soda, bleach, or harsh commercial cleansers. First, take everything off the counter and wipe it down well with a clean, dry microfiber cloth to remove all surface dust. Then, mix one teaspoon of dishwashing detergent and two tablespoons of isopropyl alcohol in a pint spray bottle and fill with cool water. Generously spray the countertop and wipe clean while polishing in a circular motion, using a microfiber cloth. Wait 24 hours before proceeding: The space occupied by the cleaning agent is the same space that the sealant will penetrate, so you must ensure that the cleaning liquid has fully evaporated. Read the sealant’s label thoroughly to understand the application method. Should our instructions vary from the label, defer to the manufacturer. Open nearby windows and doors for ventilation. If it’s raining, do not open windows that could allow rain to hit the countertop; instead, open windows in other areas of the room or in adjacent rooms. Put on rubber gloves and grab the rags. In an area usually covered by a small appliance, test the sealant to ensure it won’t affect the finish. Apply a small amount per manufacturer’s directions, by spraying or pouring onto a cloth and then rubbing it evenly over the test area. Wait the recommended time for the sealant to absorb into the granite, usually 15 to 20 minutes, but sometimes much longer. Don’t let it sit longer than recommended, because that could discolor the stone. If the sealant test area looks great, proceed to Step 7. If it has discolored, wipe up any remaining sealant with a clean rag. Then snap a few photos of the area and show them to an associate at your local home center for advice on a more appropriate product. Once you’ve acquired a new sealant, clean the counter and test the new sealant. If the test was successful, apply the sealant over the entire counter, beginning at one end and working your way to the other. Apply in sections, using a circular motion, of an arm’s length in diameter, to ensure equal coverage throughout. Wait the manufacturer’s recommended time for the product to absorb into the countertop. After the absorption period has passed, wipe any extra sealant off with a clean, soft, dry rag, rubbing in a circular motion. Some products require a second coat, so follow instructions to do so. If the product you use requires one coat, allow it cure, which can take between two and 48 hours. Nonetheless, granite experts recommend waiting a full 48 hours before wiping a newly sealed granite countertop with anything wet. Also, avoid returning any kitchenware to the counter until after the curing period. Once the countertop has fully cured, put your kitchen back in order. Keep the spray bottle of cleaner you created around for periodic use every month or two. For daily cleaning, a dab of dish detergent and a wet rag will get the job done beautifully. Strive to wipe up spills immediately and then dry the countertop to keep your granite looking great.